We're sorry, reservation times are not available online for a party of this size on the selected day. Please call us at 920.993.9087 and we will see if we can accommodate your party. Thank you for Reserving at Fratellos Riverfront in Appleton. We can't wait to participate in your memorable visit. Please be sure to include your Guest Type (required by Fratellos - Appleton). Newsletter: By selecting any of the following options, you agree to receive communications from Fratellos - Appleton. We do not share your information with any 3rd parties. You can withdraw your consent at any time. Stay personally connected to Fratellos - Appleton with your free preferences profile. You'll have convenient access to Fratellos - Appleton's news, promos and special events! And Fratellos - Appleton can get to know you better with automated communication. 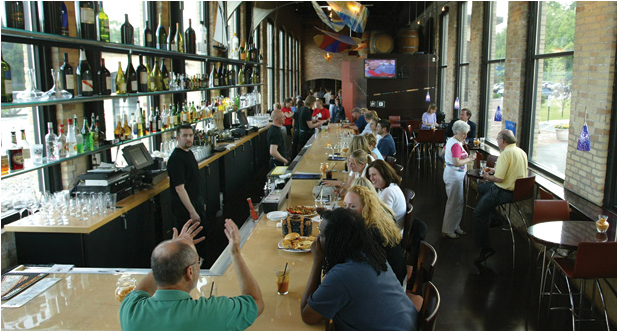 Located on the beautiful Fox River in Appleton, great views and great food are waiting for you. View the wildlife from our repurposed hydroelectric power plant location directly on the Fox River.. Expansive and ever changing wine list, Fox River Brewery Beers and craft cocktails are waiting for you. Located at the bottom of the hill where Jackman meets Water street.